The recent CD release of “Deep & Gritty The Sound Of The City Vol 1 New York” has got me looking at the Big Apple as a source of deep soul again, and this obscurity fits the bill perfectly. The song Chances Go Round is a really strong one with classic chord changes superbly well arranged by Robert Banks. You’ve got to love that churchy organ and piano, and the great brass section but most of all you’ve got to love Charlottia’s desperate vocal full of regret and pain – and the little rap at the end puts the cherry on a wonderful cake. A simply outstanding 45 – what a shame she didn’t cut any more like it. 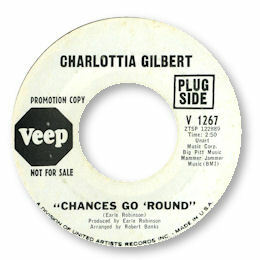 UPDATE ~ Sleuther in chief Greg Birgess writes to say that "Charlottia Gilbert was lead singer of a girl group called the Debs (Charlottia Gilbert, Monique Fords, Johnnie Lee Manning and Lynn Fields) who cut this excellent girl group sound 'Danger Ahead' b/w 'Just Another Fool ' for Double L. She was from Atlantic City, New Jersey." You can find "Danger Ahead" on Youtube here. Greg adds that "'Danger Ahead" was written by Bobby Stevenson and James Shaw. It sounds like a Detroit record but my hunch is that Robert Bateman, the producer took it to New York where this group were based." I'm very grateful to Greg as always.